The term “engineering mathematics” comes from an era when physics, mechanics, and mathematics were more closely tied together. With the dawn of high-powered computing, larger data sets, and new mathematical methods, engineering mathematics departments have begun to branch out into more exotic interdisciplinary realms, leaving students with ever more compelling career options. Margot Gerritsen (right) acknowledges students who made special contributions to the community at “ICME Xtravaganza,” Stanford University’s year-end celebration with the Institute for Computational and Mathematical Engineering community, in May 2016. Photo credit: Ana Santos. Housed within the Stanford University School of Engineering, ICME is a multidisciplinary graduate-level institute with about 200 students and roughly 60 faculty members. The institute interacts with 20 academic departments across the university, including engineering, Earth sciences, and medicine. Founded in 2004, ICME has a long history of association with Stanford’s Department of Computer Science. Before ICME, George Forsythe and Gene Golub created the “Numerical Analysis Group,” which later became known as the Scientific Computation and Computational Mathematics Program. Nonetheless, even while Gerritsen was studying at Stanford in the early 1990s, the university was already considering the establishment of a separate institute that took a broader, more interdisciplinary approach to computational mathematics. ICME has moved beyond the traditional engineering mathematics discipline and offers a Ph.D and a two-year M.S. degree, which includes specialized tracks in computational geosciences, data science, imaging science, and mathematical and computational finance. The institute makes a point of training its graduates in both the theoretical and technical aspects of computational mathematics. To prepare students for industry, Stanford encourages internships through its industrial affiliate programs and participation in large projects through the Army High Performance Computing Research Center and the Predictive Science Academic Alliance Program II Center, among others. These projects cover a broad range of topics, including genomics, physiology, and Earth sciences. Former Stanford Ph.D. student Ryan Lewis works at Ayasdi, a venture-backed machine intelligence software company that provides data analysis to the financial services and healthcare industries. His professor, Gunnar Carlsson—also a Stanford graduate—cofounded Ayasdi to commercialize his own foundational work in pure and applied computational topology. Carlsson appreciates how ICME transcends the traditional approaches to engineering mathematics. 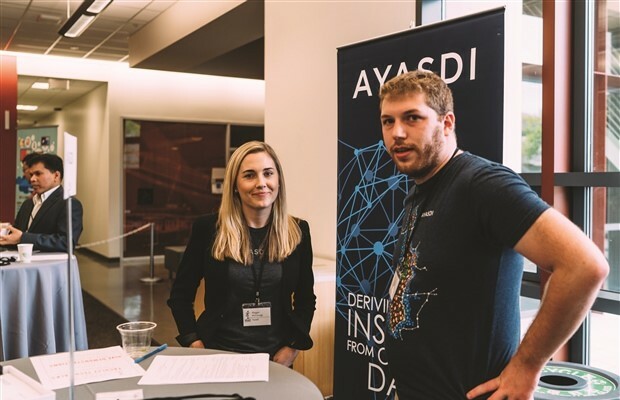 Ryan Lewis (right) represents Ayasdi at “ICME Xtend,” a two-day recruiting and networking event organized at Stanford University in November 2016 for partners and students. Photo credit: Chris Arson Photography. 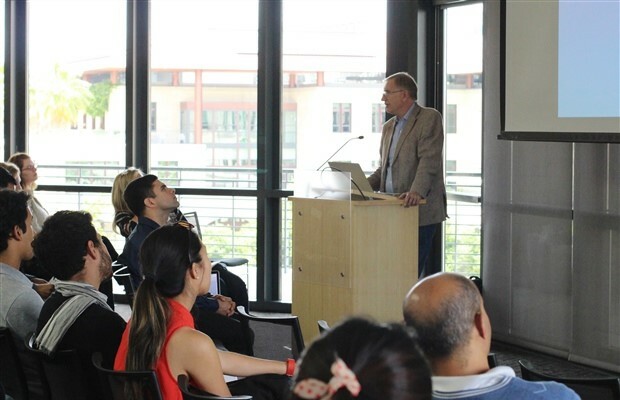 Gunnar Carlsson gives a talk entitled “The Shape of Big Data” at the ICME Xpo, an annual research symposium held in May 2016. Graduates of Stanford’s related departments of computer science and mathematics have founded companies and become educators. 2013 Ph.D. graduate Reza Zadeh established his own machine-learning company called Matroid. Nick Trefethen studied computer science at Stanford and now heads the University of Oxford’s Numerical Analysis Group. Google founders Larry Page and Sergey Brin both studied computer science at Stanford, and Gerritsen speculates that their grounding in numerical linear algebra may have played a role in their discoveries, including that of the page-ranking algorithm. The interdisciplinary Computational Science, Engineering, and Mathematics (CSEM) program at ICES offers M.S. and Ph.D. degrees and includes concentrations in numerical analysis and mathematical modeling. Students work with researchers from diverse departments, performing field tests and experiments to create predictive mathematical models, such as the injection of CO2 into demonstration sites. Wheeler also leads an Industrial Affiliates Program to help students better understand industrial challenges. The program has connections to roughly 10 companies, including IBM and various oil and environmental corporations. 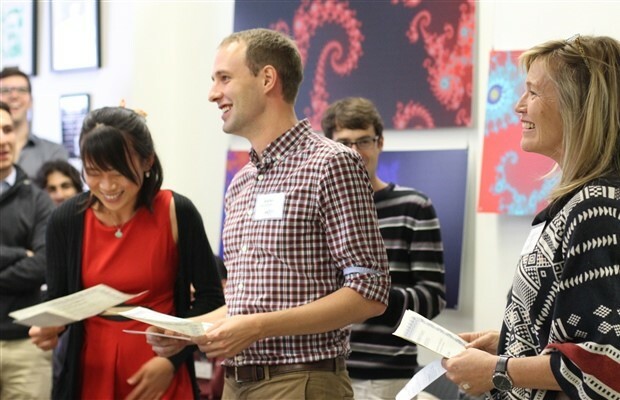 On the other side of the Atlantic, the University of Bristol’s Department of Engineering Mathematics is also seeking to broaden the definition of engineering mathematics. The department, which is within the Department of Engineering, comprises roughly 220 undergraduate students and plans to establish an M.Sc. in engineering mathematics next year. Director Alan Champneys considers the title “engineering mathematics” to be sort of a misnomer, given its emphasis on mathematical and data modeling. 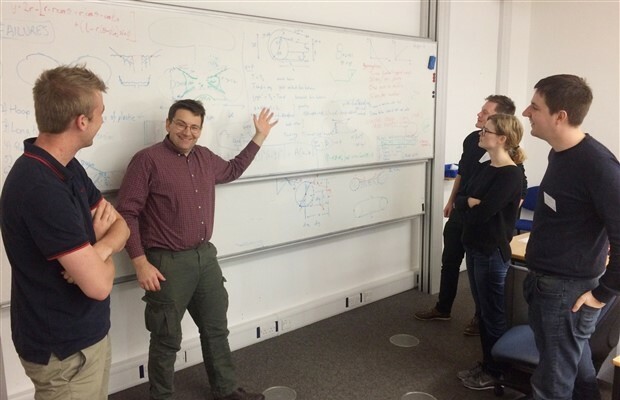 Alan Champneys (second from left) interacts with students at the Agri-Food Mathematical Science Study Group with Industry at the University of Bath this past January. Photo credit: Matt Butchers. Some of these innovative technologies are in the subdisciplines of dynamical systems, artificial intelligence, biological modeling, and robotics. Senior lecturer Nathan Lepora, once a theoretical physicist and children’s author, works at the cutting edge of neuroscience and robotics in a discipline called swarming behavior, which may prove useful in drug delivery and drone applications. Academic options include a three-year B.Eng., a four-year M.Eng. (an integrated undergraduate and postgraduate program), and an M.Sc. (one year + summer program after B.Sc.) in robotics and autonomous systems. The program has four core areas: mathematics, computational science, general engineering, and hands-on mathematical modeling. Champneys says the program distinguishes itself from a standard engineering track with its advanced mathematics courses. He plans to launch a one-year M.Sc. in engineering mathematics next year. Related to the Bristol Engineering Mathematics Department is the Bristol Centre for Complexity Science, a government-sponsored doctoral training program that has about 50-60 students completing Ph.Ds., with roughly half receiving supervision from engineering math faculty. It was once common for graduates of the Bristol program to enter careers in financial services, Champneys said, but in the last several years they have begun to gravitate more toward technical consultancy, especially in renewable energy. Some of his students now work for Frazer-Nash Consultancy, a British technical consulting firm. Every engineering math student has an industrial tutor from some company with which Bristol has connections. Thomas Melvin, who earned his Ph.D. from Bristol, works as a research scientist for the U.K. Meteorological (Met) Office, where he creates numerical models for weather prediction by starting with a very simplified mathematical model that he gradually augments based on ground, balloon, airplane, and ship observations. To the north, Sweden is known as a powerhouse in the theory of engineering mathematics, through such universities as the Royal Institute of Technology (KTH) in Stockholm and Chalmers University of Technology in Gothenburg. Around 2005, Lund University began the first engineering mathematics program in Sweden. In 2008, Chalmers established a combined bachelor’s and master’s degree program in engineering mathematics and computational science with three tracks: computational science, mathematical statistics, and general mathematics. Jacob Leander studied engineering mathematics, graduating with an M.S. in engineering mathematics and a licentiate (half of a Ph.D) in advanced engineering mathematics after a combined five years. He wrote his thesis on the optimal design of clinical studies for drugs while interning two years at AstraZeneca in Gothenberg and working in collaboration with the Fraunhofer-Chalmers Centre for Industrial Mathematics, where he completed his licentiate project on data analysis and algorithm development. After graduation, Leander worked on car GPS systems at Volvo and later as a clinical pharmacometrician at AstraZeneca, where he now creates mathematical models to describe the effects of drugs that treat respiratory, inflammatory, and autoimmune diseases. He relies heavily on dynamical systems, statistics, and ordinary differential equations. Aaron Hagström is a Manhattan-based journalist and graduate of the Annenberg School of Journalism at the University of Southern California. He mainly writes on mathematics and technology.